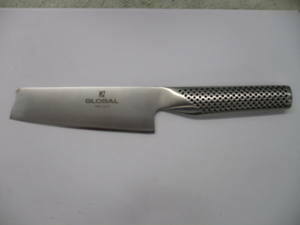 Never throw out your damaged knives, let us repair them for you. This page shows some examples of the repairs we have undertaken. 1. 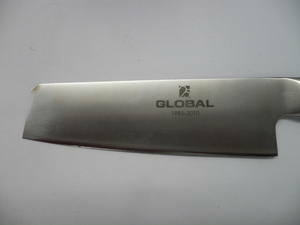 A Global knife repair. 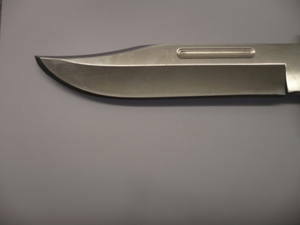 It had a single large nick in the blade. 2. 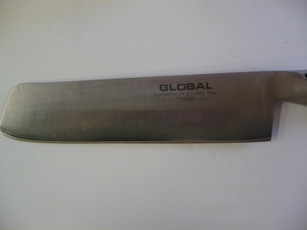 A Global knife with some very large nicks. 3. 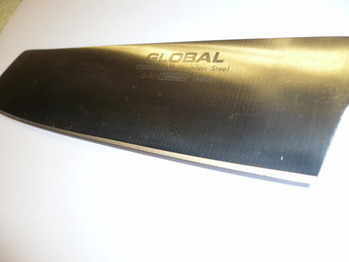 A Global knife tip repair. 4. 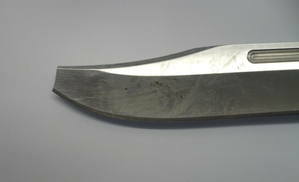 A Furi knife repair. 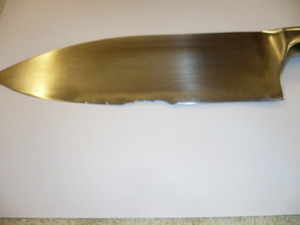 This one had large nicks and missing sections along the knife edge. 5. 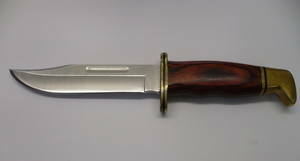 A Hunting Knife repair. 6. 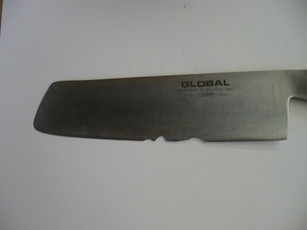 A badly damaged Global knife that had lost a third of its length. 7. 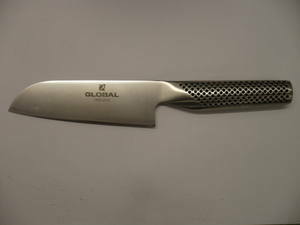 Sometimes we have very little knife to work with, but we still managed to get an edge on it. 8. 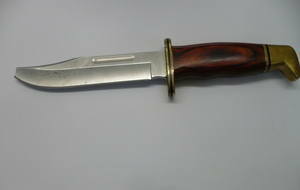 Quite a nasty nick, almost a tear really, that was removed and the knife restored. 9. 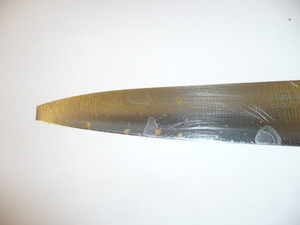 A Tojiro knife repair removing a large nick. 10. This pair of Tojiro's would cost about £400 to replace. 11. 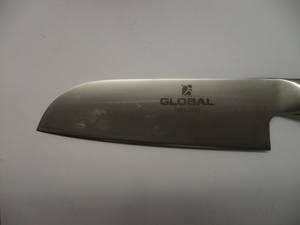 A Global knife that had significant damage. 12. 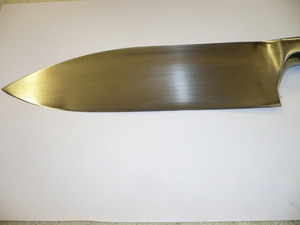 A Porsche type 301 knife large nick repair. 13. 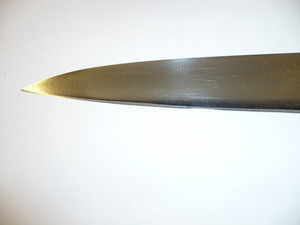 Kai Shun repair to the tip. 16. 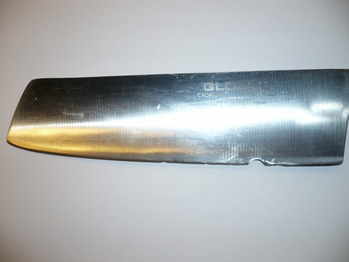 Another Kai Shun with large nicks that were removed. 17. 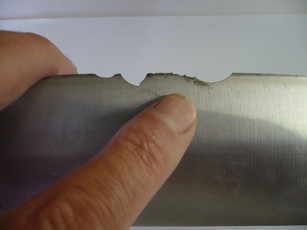 Chisel Sharpening. Notice how you can see the roof timbers being reflecting on the polished finish.